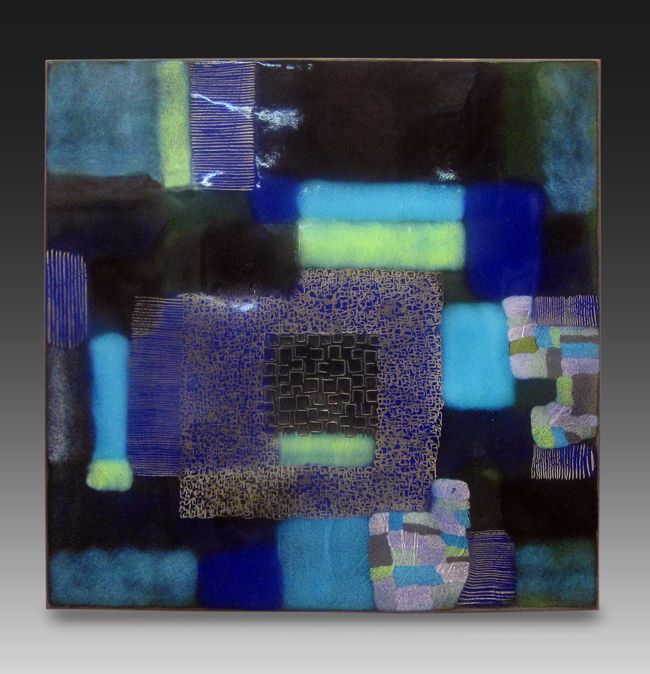 October 2015 – ADVOCATES FOR FINE ART ENAMELING INC.
Estaban Perez is a fine art enamelist who has been experimenting and innovating for forty years. Born in 1939, he is part of that “second generation” of elders continuing to build a legacy of enamel fine art in the United States. 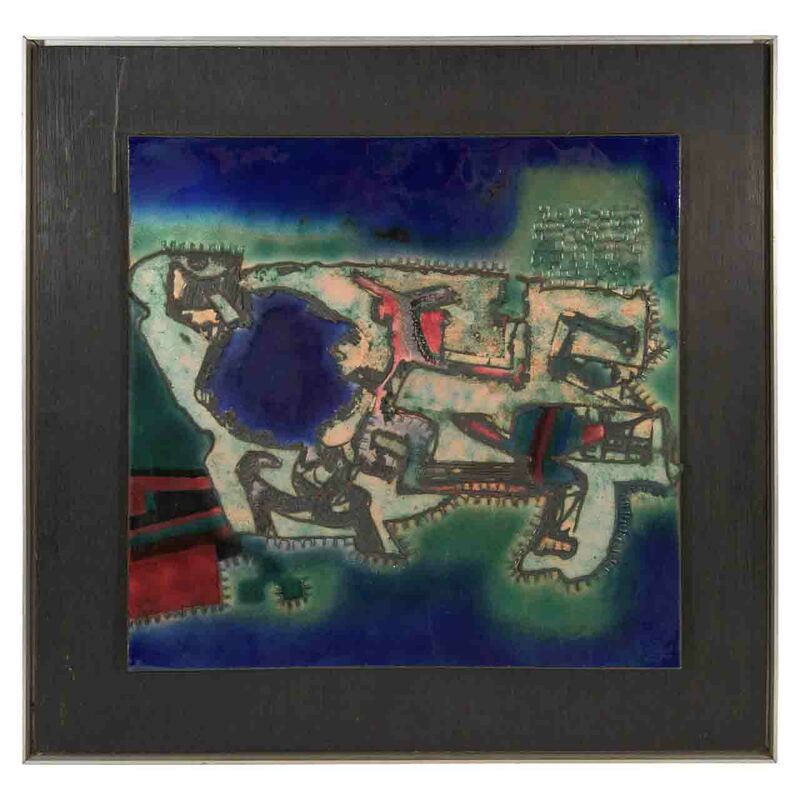 A prize-winning artist trained in multiple disciplines, Esteban Perez was educated at the University of Chile’s School of Applied Arts and studied enameling on his own. His work is represented in several museum collections in the United States and South America. Burning Sunset is an early work combining opaque and transparent enamels to create a composition with layered depth. In particular, the use of silver wire bent into open rectilinear shapes as a form of surface decoration is a technical innovation for 1970. It adds textural interest and it works to repeat but soften the sharper lines of the abstract patchwork composition. In this piece, Esteban Perez could be inviting the viewer to recall or imagine a landscape transformed by the streaming light of a setting sun. 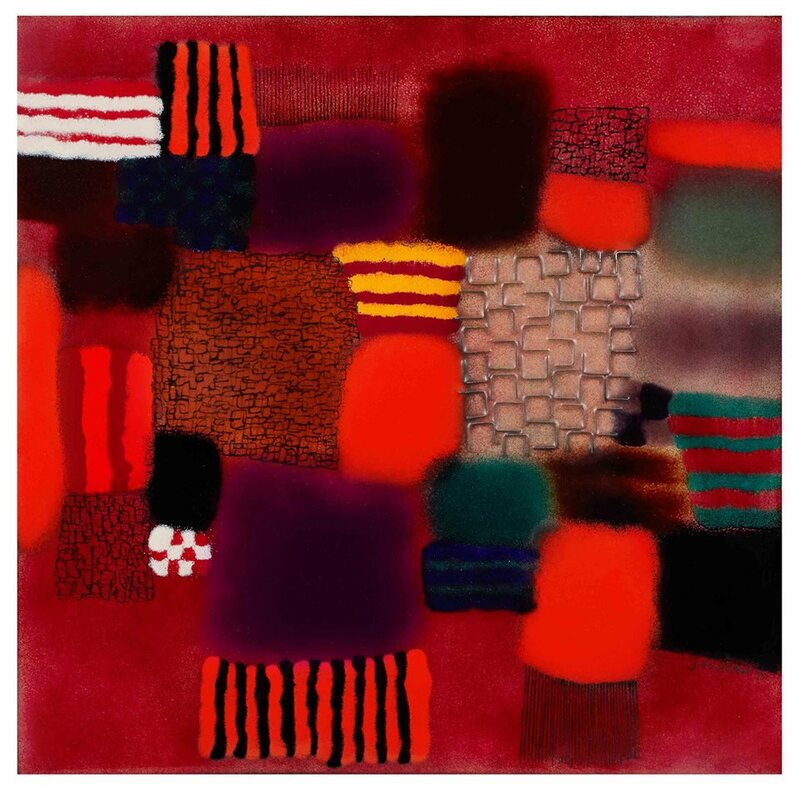 The bright, fiery reds capture attention as they pop and push against the lush green and velvety blacks. The areas of sand and gold could conjure up the shimmer and haze of the hottest summer evening. The white areas could suggest the mundane objects near and far that resist the artistry of the sun’s rays. Burning Sunset is a uniquely beautiful and decorative enamel, but so much more than a decoration. Completed in 1971, Silver and Platinum Square continues Esteban Perez’ composition and enamel experimentation. Flight to Infinity is another variation on Esteban Perez’ fascination with light, scale, and the surface qualities of vitreous enamel on copper.